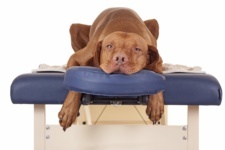 At ARFit Dog Therapy Chicago, they use a variety of massage techniques to improve your pet’s well being. Welcome to Part 2 of the Massage for Dogs series. If you haven’t read Part 1, we encourage you to start there! Before we delve into the many massage techniques we can use on our furry family members, we need to prepare ourselves, our pet and our environment to insure a pleasant experience. It is important to do massage when you and your pet are both relaxed. Make sure you have at least 15 minutes of undisturbed time together. Attempting to massage your dog when they are excited may prove to be unpleasant for both of you and may even have the reverse effect. Massage after dinner or at the end of the day. 20-30 minutes after a walk is best when they have been able to expend some energy. They will be more receptive to your touch and more willing to lie still. Some dogs love massage right away and will let your stroke them for hours. Others may be very sensitive at first. Start out gently for 1-2 minute “sessions”. Remember, you are building trust through touch and sometimes touching in areas that may be painful. It is always better to do less and see if your dog likes it. Over time, as long as your dog enjoys it, there’s no limit to how long you can massage them. 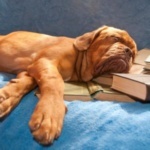 You are doing this to help your dog relax, feel better and move better. if they don’t like it, you are not helping. If they are enjoying it, they will probably stretch, give out a nice heavy sigh and wag their tail. Signs they may show if they are NOT enjoying it include: stiffening up in the areas you are touching, flinching or twitching, changes in breathing, growling or snapping at you. If any of these signs are exhibited, stop until they become comfortable and calm again. Be gentle. You only have one chance to make a first impression. A good experience insures a repeat performance. Ever been to a spa? They’re quite calming. Soft light, comfortable temperature and soothing sounds. This is good. A quiet room without activity and noise reduces distractions for you and your pet. Low noise also allows you to hear changes in your pet’s breathing which gives important signals as to how they are responding to your touch. If you like some music, check out YouTube and search for dog massage music. I prefer quiet and/or Bach at a very low level. Although scented candles sound like the “spa thing” to do, strong odors can sometimes be offensive to your pet. The Floor? A bed? A Massage Table? At Arfit, we have a padded, adjustable height treatment table which allows maximum comfort for our patients and therapist. At home, we don’t usually have that luxury. 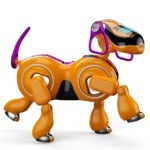 If you have back or knee issues, it is probably best to avoid working on the floor with fido. 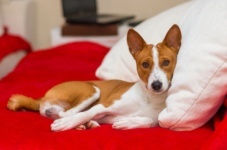 As long as you are comfortable with your dog on your bed, massaging at this level can be more comfortable for both of you. Otherwise working on the floor is fine. Carpeting and a soft comforter are suggested. Air mattresses have been tried and are usually too “bouncy”. One also runs the risk of puncturing the inflatable mattress which never ends well. Just as you want your dog to be calm and relaxed, so should you. Find a quiet time of day when you can also relax and be free of distractions. Turn off the TV. Ditch the cell phone. Time to connect with your pet. Wear comfortable clothing such as sweats or work out wear. 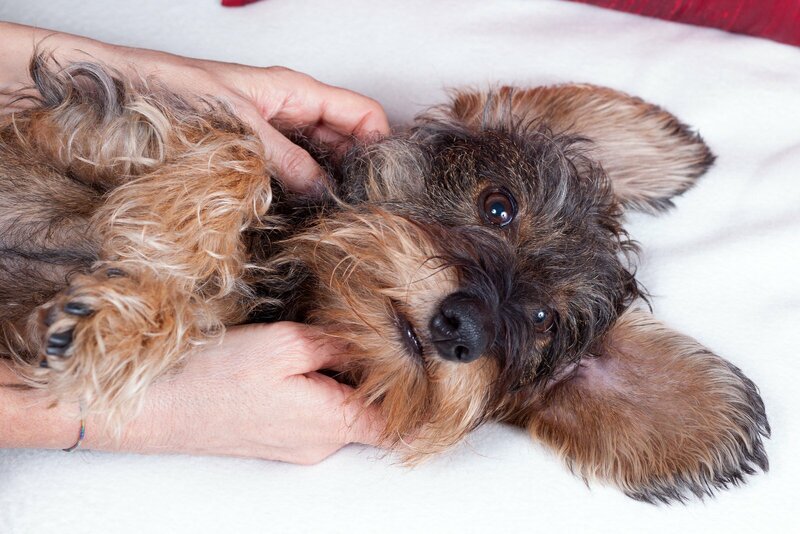 Remove any excess jewelry that may get caught in your pet’s fur or make noise during massage. Avoid strong perfumes. Before massage, a bit of stretching is good. Tai Chi is very good. https://www.youtube.com/watch?v=-kJzyrIM1cg Be sure to gently stretch your hands, fingers, arms and legs to allow you to move better and adjust to your pet’s movement’s during the session. In part 3, we will discuss proper massage techniques and positioning for you and your pet. Interested in ARFit’s services? 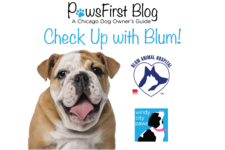 Windy City Paws customers receive a special discount! Visit our Community Involvement page for more information! Originally published May 2, 2017.